Don’t let the awfulness of this film fool you. Arnold’s first and greatest film is, in fact, one of the greatest of all time. Just as financial firms regularly turn losses into gains by multiplying their balance sheets by -1, this film uses awfulness as a deus ex machina to capture the profound depths of our mortal fallibility. Pretzie is the ultimate everyman, selling pretzels by the water and figuring out ways to nickel and dime everyone and pocket the loose book every now and then. But he gets into trouble and has moments of revelation and regret. 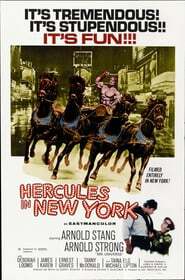 Hercules’ simplicity and god-like physique, as well as Monstro the Magnificent’s lopsided hair cut, symbolize the yin and yang of life and death, bigness and smallness, truth and the GOP. The frequent unfocusing of the shot shows that mankind’s mind is frequently unfocused and Arnold’s partially literate accent represents the garbled marbles we often use to express the inner desires of our hearts. On a daily basis we are tempted by god-like greatness but frequently fall short of the world’s expectations for our bulbous necks and mountainous pecs. Hubris is a 1000lb barbell and it kills. So we are frail, so we must crawl. Don’t be a long shot plunger. We can not temporize the mighty Zeus. This film must be cherished.